The open source robotic building platform, Meccanoid G15 KS from Spin Master, won top prize in a "Last Gadget Standing" showdown at CES on Thursday. Damon Poeter of PCMag described The Meccanoid G15 KS as a programmable, walking, talking robot. 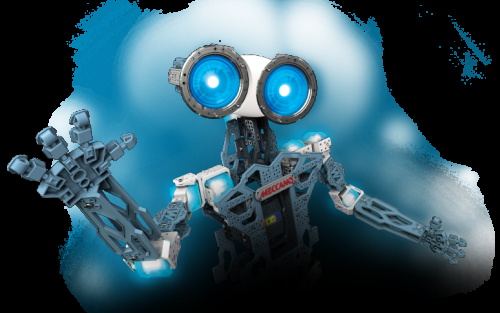 The Meccanoid G15 KS is from the Meccano brand, acquired by multi-category children's entertainment company, Spin Master, in 2013. Meccano's roots go back to Frank Hornby in England in 1901 where Meccano was conceived as a model construction-kit system, involving metal strips, plates, wheels, axles and gears, and nuts and bolts to connect the pieces. Ben Gadbois, global president for Spin Master, said, "The public has spoken loud and clear." Judging was based on approval by the audience via an applause-o-meter. He said the Last Gadget Standing award was "a huge validation for the amount of creativity and innovation that went into our robot." The building platform covers a range of ages and skill sets. The robot is designed to encourage children ages five to 14 to enjoy and learn from the experience of building, modifying, and programming robots. Users can program their robot with one of three programming options. Ben Varadi, executive vice president and chief creative officer for Spin Master, said simplicity was central to the design. What is more, because the movement-mirroring Meccanoid G15 KS is open source, it can be programmed however you like using any code programming in the marketplace. Data communication protocols, said the company, will be made openly available. The robot has bidirectional motor-driven feet. Smart servos function as motors and position sensors. Meccanoid G15 KS has six arm servos for arms-range motion and two head and neck servos. The robot can record and play back animations, process voice recognition and communicate with smart devices through Bluetooth Low Energy. The robot uses its onboard "Mecca Brain." According to the video, it comes with a programming option called Learned Intelligent Motion, and it is simple to program the robot. The "LIM" is where you move and record Meccanoid's movement and speech, and it will play back. Avram Piltch of Tom's Guide said he had the chance to go hands-on with an early build of the Meccanoid at the CES event in Vegas. "I was able to program the Meccanoid to perform a sequence of motions by pressing the record button on its chest, manually moving its arms in a pattern and then pressing the button again to stop recording. When I hit the button next to it for 'play,' the robot repeated all the movements and even outputted a sound clip of the words I spoke while recording." The material is polycarbonate. The company described it as "high-impact polycarbonate construction plates." The LED eyes have numerous color variations. The company promotes the Meccano brand as serving to create, and stretch kids' imaginations, allowing them to learn while having fun. PCMag said the robot kit is set for general retail release later this year at $399, available through retailers and hobby and electronic shops.